I remember some comedian saying once that there should be an express line at Starbucks for those of us who have a real need for coffee, and let the people who treat it as some kind of entertainment stand in another line. You know the people, they get to the front of the line and then start asking a lot of questions about multisyllabic drinks that contain sugar, milk crushed ice, fruit and for no reason I can fathom... no coffee. Then they order one of those mochafrappechinolisousness drinks and half the staff behind the counter is suddenly busy with crushing ice, going into the back for the special chilled coffee, growing bananas, and all the other things that go into the construction of a drink that probably has more cumulative worker hours than Boston’s Big Dig (wiki it if you don’t get it). Meanwhile I’m going into caffeine withdrawls. Now, this is a very dangerous situation -- the stereotype of a caffeine addict missing his or her coffee isn’t exactly puppies and sunshine. It’s hair trigger rage and axe murdering. And it’s not just the caffeine, it’s that I need to get online and start working, or at least surfing Facebook. Now I have two withdawls going on -- coffee and internet. 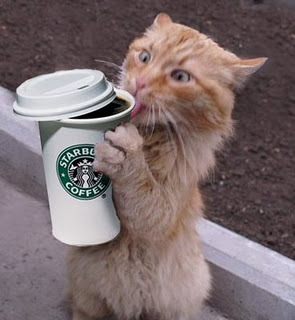 I have to make snarky comments about cats with coffee cups, and I can’t do it until I get online, and I’m not going to have that perfect, cutting humor unless I’m a little wired. Now, there are those who would argue that my double-tall-non-fat-latte is about as froofy as a mochafrappechinolisousness. I would suggest they don’t argue about my caffeine delivery system until I actually have that caffeine being delivered. But I would also argue that I don’t order a complex steamed milk espresso beverage in a place where they have to break routine to make it for me. When in Rome, have a doppio. The coffee in Southern India is thick and rich, and they mix half a cup of coffee with warm milk they keep in a kettle. Thai coffee is amazing with all its sugar. And in London? I have that Starbucks Via instant coffee that I pack in for when the coffee is more reminiscent of rusty water pipes than a hit of cocaine. So, back to the rambling mochafrappechinolisousness order. It’s not about the drink, it’s about letting amateurs in the same line as the pros. I have a similar argument for the girls at the bar who require two bartenders to figure out what they’re drinking -- step aside ladies, and let me show you how a pro does it.